At trial, it was proved that being gay is an immutable characteristic. Yet, there are some who believe one can, and should, change their sexual orientation. 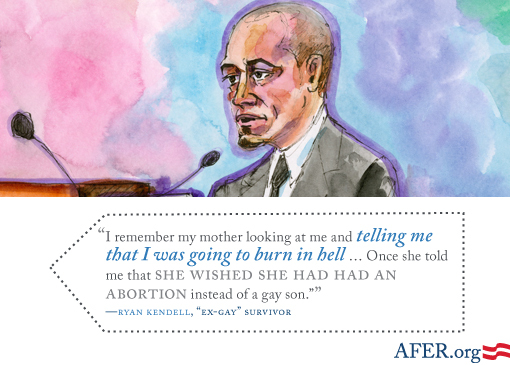 Ryan Kendell took the stand to talk about his experiences undergoing so-called “ex-gay” or “reparative” therapy. Parts of Ryan’s testimony were recreated in a powerful scene of the L.A. premiere of “8″ by Glee actor Chris Colfer. 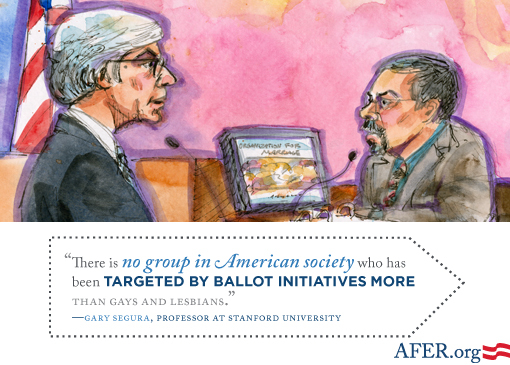 Then, Stanford political science professor Gary Segura testified about the political powerlessness of gay and lesbian people in the United States. Professor Segura explained that gay and lesbian Americans lack a meaningful degree of political power, and possess less political power than other minority groups that have been granted judicial protection. And watch James Pickens, Jr. reenact Professor Segura’s testimony during the Los Angeles premiere of “8” the play.